I know enough has been said about our beloved jodhpuris. But ‘never say never’! Here are some additional tips for my guys about jodhpuri pants who love their Jodhpuris! Jodhpuri pants worn with the sherwani should match in color. However they need not be of the same color. The color combination should be bold but elegant. Suit should ideally be in dark colors that complement your body structure and also graps some sighs! Colors like Persian blue, mauve, Taupe etc. Jodpuris go well with a vest and shirt as well. Your pants may match your shirt or vest. But make sure your vest is beautifully designed to do justice to your pants! The best look for Jodhpuri is the Indian look. Your vest will add the flavors of India to your fashion. Jodhpuri pants should be paired hand-made, customized mojaris. The mojaris should be made using the same fabric as your attire and should be designed using intricate patterns and sequences. 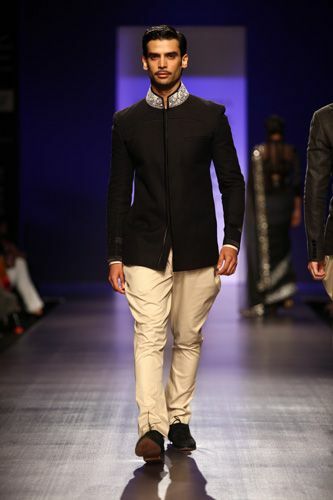 Apart from mojaris, for a more youth-icon look, go for formal shoes with your pants. The shoes should be self-designed and POLISHED. Your socks cannot be white. ‘White’ is not formal wear guys please stop making this basic mistake! That is of the Royalty. I am not making all this up! Always wear a watch with your Pants. This is because Jodhpuris are a sign of masculinity and elegance. What is a man without his watch? Use beautiful and classic watches with your pants. You might like to read this – Which Watch To Buy? Remember to accessorize your attire with a pocket square, broach, cuff-links and beautiful verities of headgears like Safa or Kufi hats. Pocket square and cuff-links are for a formal and simple but elegant look. Whilst your Broach, Safa or Kufi and even Sarpech are for a more traditional look often opted for by the groom. Polish you shoes, look sharp, stand tall. This outfit is all about your attitude. Do not consider yourself any less than a Royalty! Fashion is void without its fit. Your entire outfit stands at mercy of your fit! Do not compensate on this one guys. Always get it stitched along with your mojari, pocket square and safa or kufi. Get your whole attire on point and let the magic happen!